CM Magazine: Bleeps and Blips to Rocket Ships: Great Inventions in Communications. 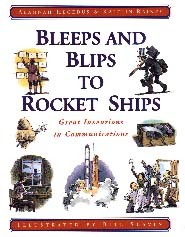 Bleeps and Blips to Rocket Ships: Great Inventions in Communications. Alannah Hegedus & Kaitlin Rainey. 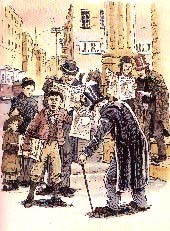 Illustrated by Bill Slavin. Radio dramas required convincing sound effects, and soon radio stations were full of a whole assortment of junk used for creating just the right smash, crash, creak or rumble. Some things were built specially, like door frames that could vary the pitch of a slammed door. Coconut shells were "walked' across gravel to sound like horses, steel sheets were wobbled to make thunder, and cornstarch boxes were squeezed to sound like someone walking through snow. As microphones and amplifiers improved, different techniques were needed to create a realistic sound effect. Eventually, whole libraries of sounds were recorded and sold to radio stations around the world. The work of ten creative and talented Canadian inventors is showcased in this detailed, informative book. Ten chapters cover a wide variety of communication-related topics, beginning with the invention of newsprint and including the halftone photograph, panoramic camera, transatlantic phone cable, telephone, radio wirephoto, satellite and fibre optics. These marvels of communication had a profound impact on the way people all over the world send messages and were the frontrunners for cellular phones and TV transmissions via satellite. The authors have done thorough research into the inventors and their creations. By employing fact boxes, little-known trivia and a fairly simple writing style which helps readers to see the inventors as human beings rather than mere scientists, the authors deliberately set out to sustain readers' interests. For example, William Stephenson, aka Intrepid, one of the greatest spies of the 20th century, was a good friend of Ian Fleming, author of the "James Bond" novels. Fleming used some of Stephenson's real-life experiences as the basis for Bond's adventures and frequently consulted Stephenson about the spy gadgets that Bond uses in the books. For the science and/or science fair buff, there are instructions on how to make paper, create a halftone image, build a pinhole camera, wire a telegraph, use Morse code and make a light fountain, all with simple inexpensive materials that are readily available. There is a great deal of text in this book (almost too much info) but it is offset by the mixed media (inkline and watercolor) sketches. A glossary and an index are also provided. Despite its being a very good resource for students doing research on communication or Canadian inventors, this book has a fairly limited audience.